A basic cot for baby holidays in Paris. 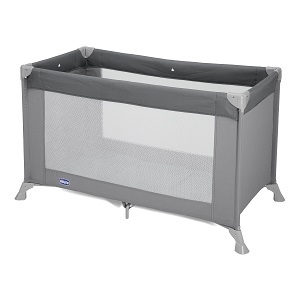 Easy to use travel cot. Suitable from birth up to 3 year. Rented with an extra mat, matress protection and cotton fitted sheet. Chicco Goodnight, Safety 1st or Nattou models, depending on availability. Attention: this product can only be delivered in Paris and Ile-de-France area. Need to rent a crib in Paris for more than 1 month? Contact us for a specific quote. Chicco Goodnight is a folding cot that is easy to use. You will be able to open and fold it in less than 5 minutes. It will allow your baby to sleep comfortably and in full safe condition wherever you're staying - hotel, apartment rental, friends, relatives. All our crib rental are delivered with a matress protection and cotton fitted sheet. With this cot, we recommand you to add a extra mattress. Alexandra (May 2017): "Camille has a wonderful service that alleviates the stress and effort involved with traveling overseas with little ones. The products are clean and well taken care of. Camille herself is punctual and responsive. A pleasure to work with and would definitely rent from again!" Nancy (March 2016) rented a travel cot in Paris Le Marais, delivered to her rented apartment: "A really convenient way to travel to Paris with our new baby without having to bring items our worry about a crib." Tennille (from the USA - September 2015): I heard of the Babytems webpage when my husband and I had learned we were going to live in Paris for almost 3 weeks due to his work. I quickly did my research and found some blogs from mothers who have travelled with their toddlers in Paris and they had some suggestions. They suggested renting a baby crib instead of bringing one. We didn’t even realize that this was an option! The idea of lugging two giant suitcases, carry-ons, a stroller, toddler AND a pack-n-play that weighed a ton was overwhelming. To be honest, I was not certain as to what to expect. I am an anxious mother…were the items really going to be delivered as promised? Were the items going to be clean? Would I have to bring my own sheets? If provided, would I have to launder the sheets myself? Was my finicky toddler going to be comfortable? Would this cost us a fortune? I went on to book and decided on the Chicco Goodnight cot. I entered my credit card information and threw caution to the wind. I heard from Camille Spanjaard from the company almost immediately, which made me happy. She recommended an additional mattress with the cot, and I was uncertain as to whether I should get one but eventually did (and glad I did). We had no working phone while in Paris and only had email to communicate. I made arrangements with Camille in advance. We arrived to our apartment in Paris after over 12 hours of travelling (with a toddler), exhausted and starving! I emailed her when we got settled in. I had no idea how to get into our building or work the buzzer to let Camille in. She took the stress away! She was on time (if not early) and figured out how to get to our apartment. She walked up 4 flights of steps and personally delivered the cot, the extra mattress, the sheets, and the instructions. She answered all of my questions and was very helpful. As soon as she left, I set the cot up with ease and made the bed up. Everything was clean and in great condition. Before long my toddler was fast asleep in his crib and was “at home” the entire time. When the time came to pick up the cot, Darine came to pick it up. I was having difficulty folding it up (user error), but she had no issue to pack it up for me and haul it away with a smile. With the cost of it all and the amount of time that we rented it, it came out to be approximately $5 per day for rental…not bad! Plus, it was way better than the pack n’play that we own at home! We did not have to launder the sheets when we returned them either. Should I return to Paris while my son is still young, I would definitely rent again from this company! It’s not easy living in a foreign country with a toddler and if you can have some basic comforts of home to make the process easier, then go for it! It has not been commented yet.